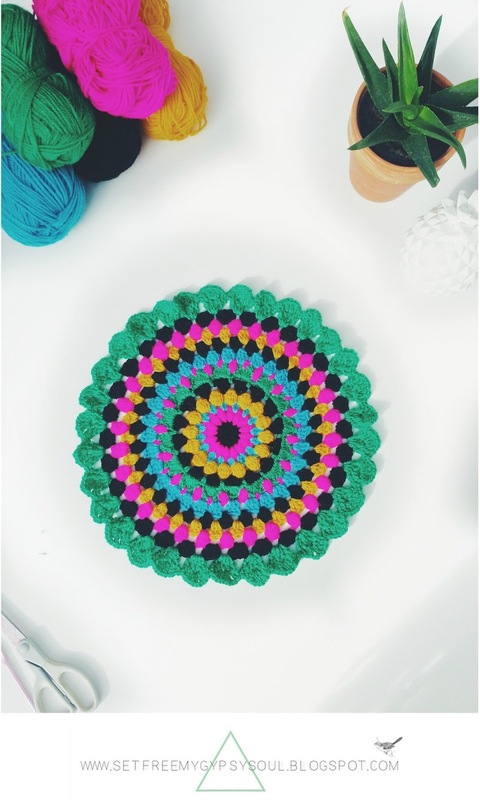 Make this pretty floral folk art inspired boho Mandala using a combination of treble crochet, bobble stitch and the humble chain. I am so into my Bohemian Brights at the moment and I just love this combination of folk art inspired colours! 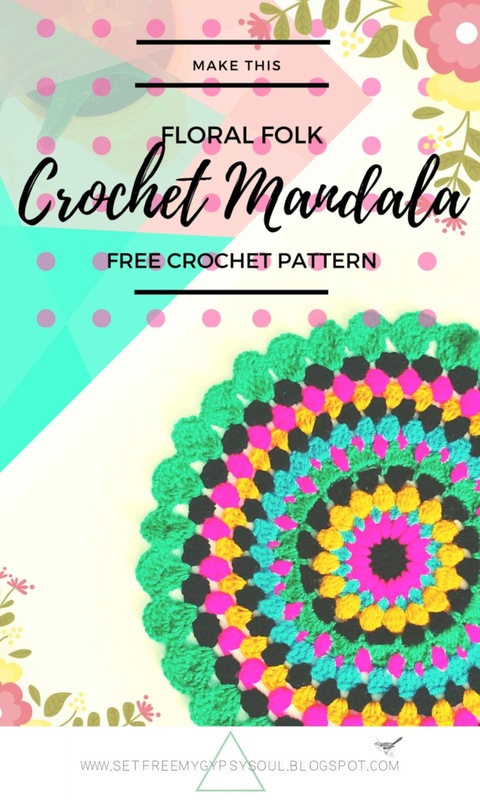 This free floral mandala crochet pattern is so easy to make and works up really fast. Yay! It's perfect for placemats, table mats, doilies, wall art... even turning into stool pads and cushion covers. The pretty frill edging looks tricky but is actually very simple to crochet... a combination of treble crochet (US double), htc (hdc), double crochet (US single) and chains. As with all my patterns, there are no set rules! Pick your own colours, change up a stitch if you want to... I think too many rules and regulations squish individual creativity, and that's what makes Fibre Art awesome! 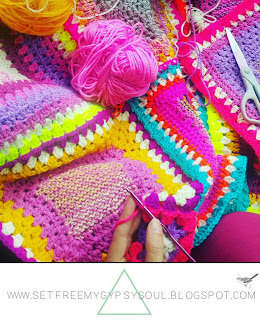 Below you will find details of the crochet stitches used on each round in UK and US terminology and you can use the pics as a guide to colour change. Happy hooking! And don't forget to share your Floral Folk Art Mandala with me on Instagram by tagging @setfreemygypsys0ul or using the hashtag #SFMGS. For my other social media accounts, click here. Selection of DK yarn. 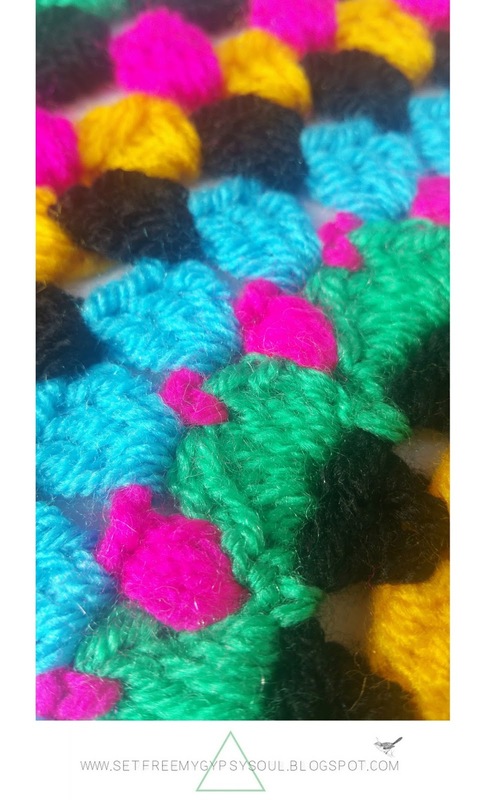 I used 5 colours: Big Cole Neon DK in Hot Pink , +Hobbycraft Northampton / Hobbycraft Women's Institute DK in Turquoise, Black and Yellow ... And a yummy Jade Green Bonus DK from a local discount store. The Turquoise Women's Institute yarn from +Hobbycraft is a new one for me and I love it! It is sooo soft and easy to work with. Round 1: Make a magic loop and chain 3. This is your first treble Crochet. Make another 15 trebles into the loop. Join with slip stitch and cast off, weaving in your ends. Round 2: Cast on into any chain space and make a 4 y/o puff stitch followed by a chain 1. Repeat in all chain spaces. Round 3: Two trebles (US double) and ch 1 in each space. Round 4: Turn your work and make a 6 y/o bobble stitch followed by a chain 1. Repeat in all spaces. Round 5: V stitch! Turn your work back to the right side and make a treble (US double) followed a chain 1 and another treble (Us double) into the same space. Chain 1 and repeat around the circle. Round 6: Cast on in between a 'V' and make a double crochet (US single). Chain 4. Make another double crochet into the next space between 'V''s. Repeat all the way around. Join with slip stitch. Round 7. 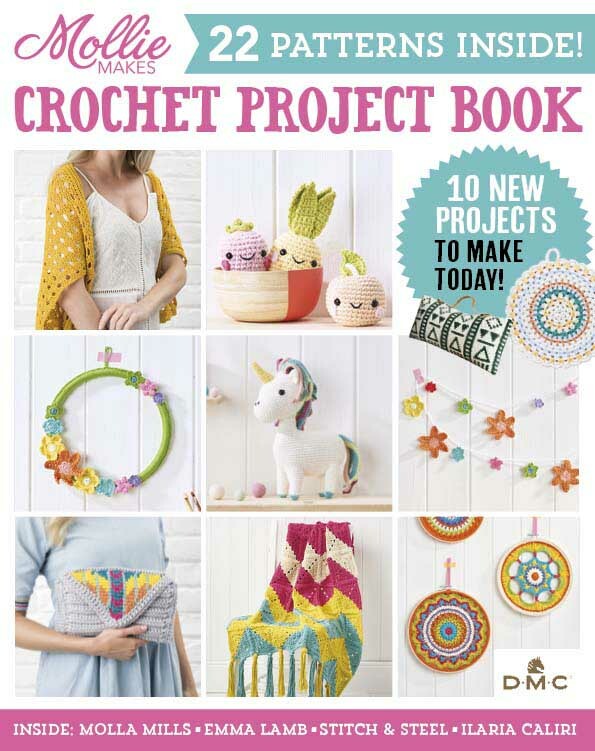 Make a double crochet in one of the loops you have just made. Follow this with a htc ( US hdc) and 4 trebles - all in to the loop. Make another htc (US hdc) and double crochet (US single) into the loop and you have a pretty shell leaf/petal shape. 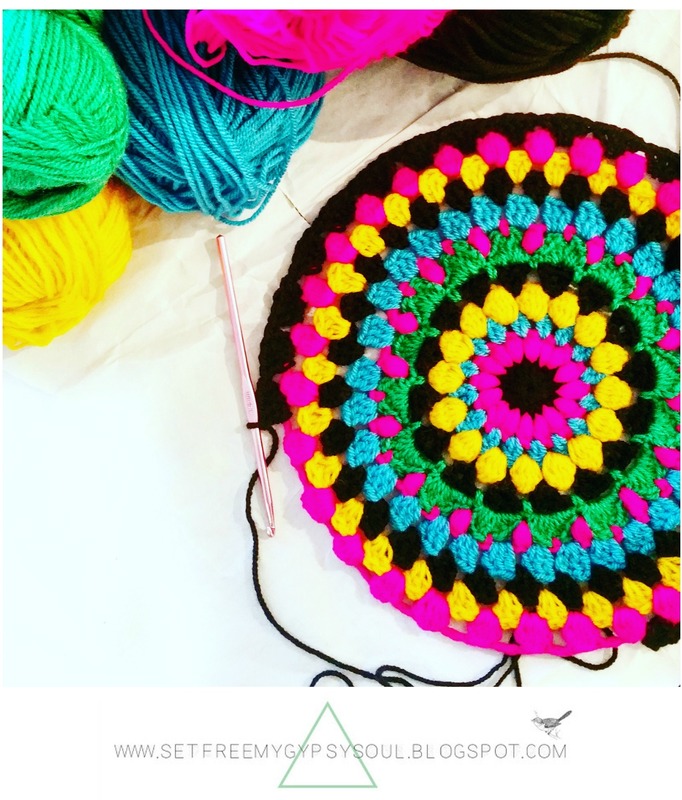 Make a double crochet right into the next loop and repeat the pattern in each loop around the mandala. Round 8: This round is made using more 4 y/o puff stitches, but this time you want to make them right into the space made by the two dc's between 'leaf petals'. Cast on, make a puff stitch and then chain 2. 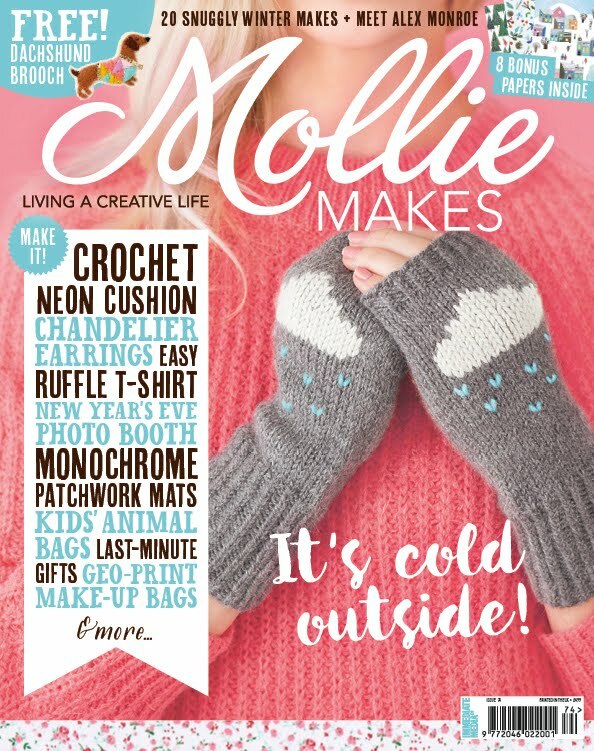 Make a double crochet (US single) into the middle of your 4 trebles (US doubles) you made in round 7. Round 9 - 11: Simple sets of granny stitch clusters and ch 1's in each space for each of these 3 rounds... cast on, chain 3 and then make two more trebles into the space. Chain 1 and repeat a cluster of 3 trebles. Round 12: 6 y/o bobble stitch and chain 2 in each space. Round 13: 4 treble crochets (US double) into each chain space. The pretty shell ruffle effect edging is made across two rounds and is soo easy! 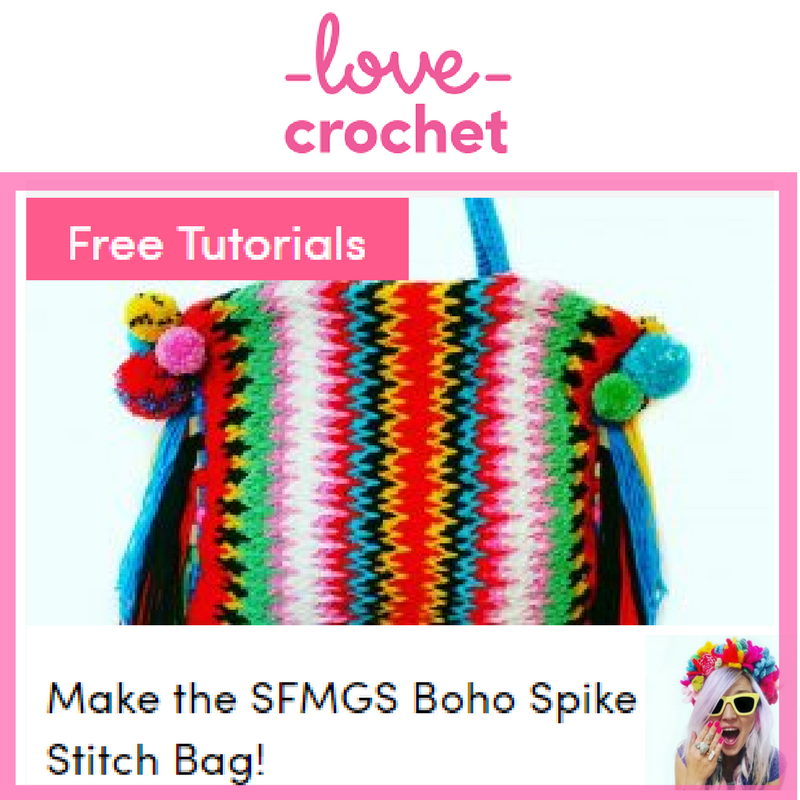 Don't be put off if you are new to crochet and it looks complicated... if you can treble and chain you can make this edging! Round 14: Cast on into a space between your clusters of round 13 and chain 3 (this counts as your first treble - US double). Make another treble (US double) into the space and chain 2. Follow with another two treble crochet (US double). Chain 3. Repeat in every space around the mandala. Round 15: Using the same colour, cast on again in the middle of a chain 3 space. 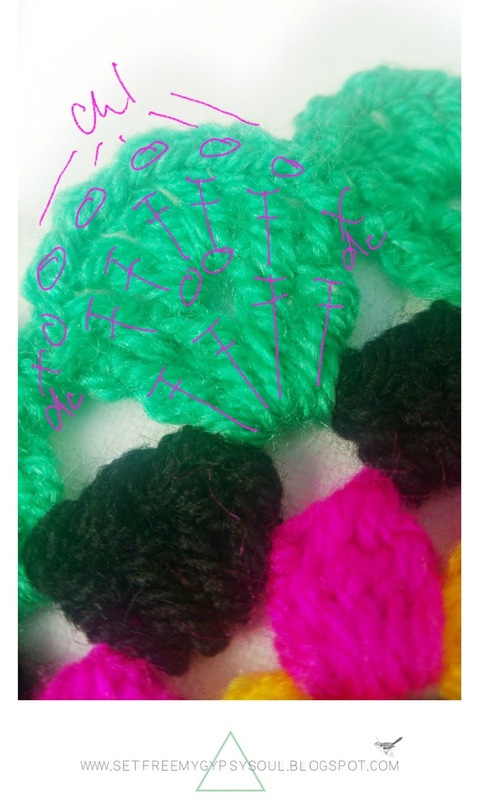 Make a double crochet (US single) and chain 1. 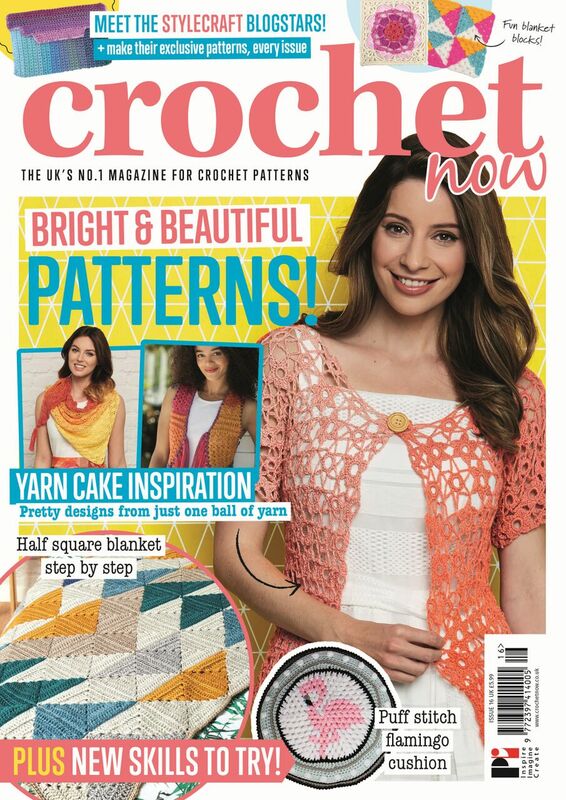 Then make a treble (US double) crochet into the space between your two trebles from round 14. Chain 1. Make another treble into the loop you made with your ch 2 from round 14. Make a treble crochet (US double) into the loop and chain 1. 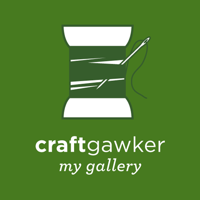 Make another treble crochet (US double) and chain 1. Treble crochet into the space between your second pair of trebles from round 14. 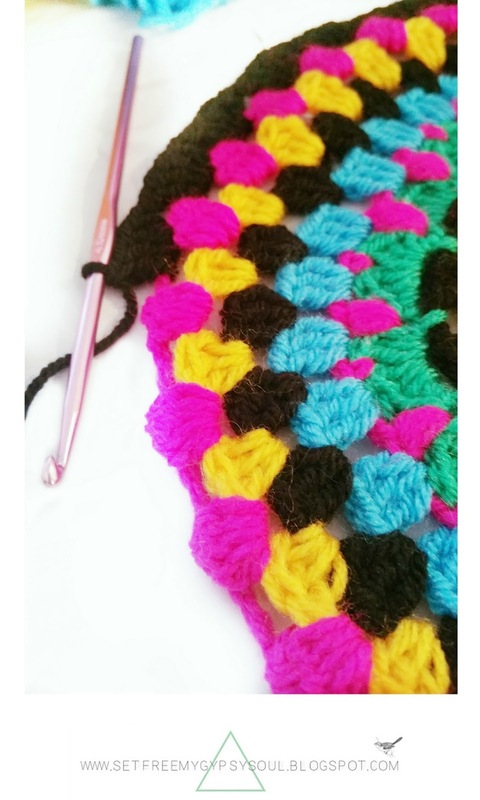 Chain 1 and make a double crochet into the middle of the next ch 3 from round 14. 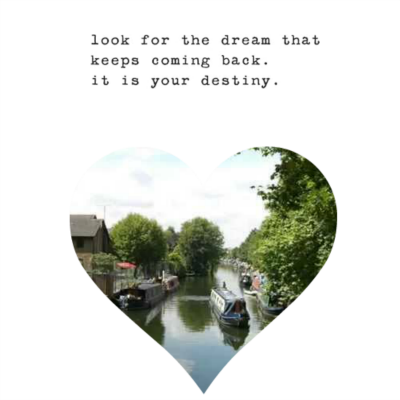 Repeat in every pair of trebles you made. 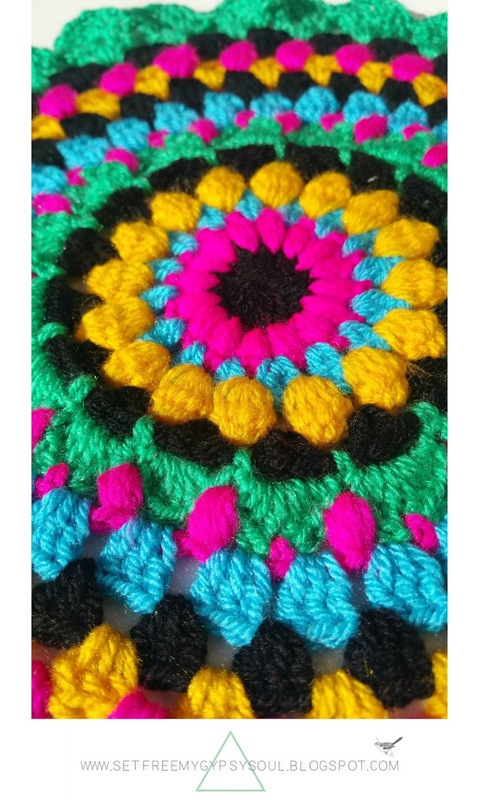 A beautiful bohemian folk art inspired Mandala and the perfect floral addition to your crochet collection . If you liked this free mandala crochet pattern, be sure to share with your friends, family and fellow crochet addicts! PLUS... Show me your fibre art by tagging me @setfreemygyspsys0ul on Instagram or using the hashtag #SFMGS. Really great, it's so much "summer" <3! You are definitely one talented lady, Lily! I am more of a neutral (I know boring)-kind of gal, but I ADORE the bright-cheerful colors you chose! !